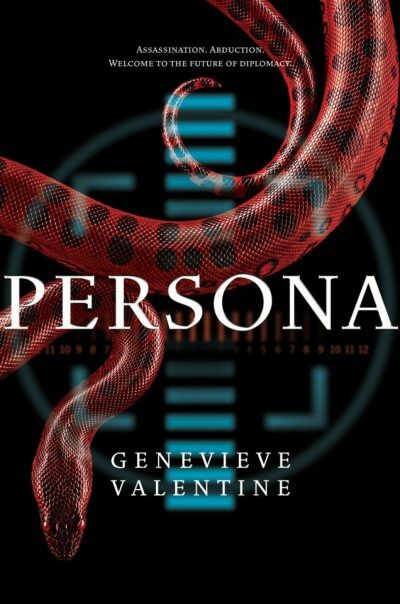 2015’s Persona is Genevieve Valentine’s third novel. Suyana Sapaki is one of the International Assembly’s Faces, youthful delegates whose demanding jobs offer very little in the way of power or job security. Even popular Faces can fall from grace overnight and Suyana is nothing like popular; not only is she herself less than personable, but the United Amazonian Rainforest Confederation itself is something of an international pariah. Summoned to meet with the American Face and his handlers to negotiate the terms under which the two Faces will feign a relationship—an arrangement that Suyana regards as indistinguishable from state-sanctioned prostitution—she gets a hint that someone believes her utility has dropped below zero. That hint comes in the form of several bullet wounds, none fatal. Suyana manages to escape from her would-be killer thanks to the timely assistance of journalist Daniel Park. Wounded and on the run, she has no idea who wanted her dead. Was it the Americans, irritated by the UARC’s reluctance to allow American companies free rein within UARC territory? Her own nation, believing her violent death would best serve UARC’s goals? Someone within IA who suspects Suyana might be working with the anarchistic Chordata, a group whom the IA considers terrorists? Or was the assassin sent by someone within Chordata itself, for reasons about which Suyana can only speculate? If she guesses wrong, she will die. And she has no idea that it’s no coincidence Daniel Park was in the right place at the right time to help Suyana flee…. Once again my big stumbling block is the worldbuilding. I can accept a new world order. The IA is to the UN and WTO as they were to the League of Nations. Each organization has been more powerful than its predecessor. It makes perfect sense that the new system would be set up to serve the interests of the major players, because who else would have the power to set it up? Using up Faces so prodigally seemed a bit over the top, but on reflection it is not so different from the way the entertainment industry chews through twenty-seven-year-olds today. It’s not as if there aren’t lots of pretty young people who would be glad to take their places. I can also accept that, in a system that seems to accept routine assassinations, a hired gun might actually be bad at their job. Someone has to be the worst at the job in every profession 1. And then, for purposes of plot we want a protagonist who is merely threatened, not one who dies in chapter one. However, the backstory for the UARC seemed as improbable as the new nation’s name. I never got the sense that there was a plausible history underlying the plot-friendly surface. A gritty, noir story of suspense won’t enthral unless it’s set in a convincing context. For me at least, the world through which Suyana flees is just a sequence of colourful but unconvincing backdrops. I also found Suyana too bullet-proof to be believed. I have not been shot—yet—but I was impressed that Suyana managed to shake off two major wounds with less inconvenience than I suffered from a single debilitating head wound. Granted, Suyana had the advantage of knowing if she stayed stationary for too long the assassin would finish the job, but still … she shows determination far above the Molly Craig level. I suspect that other readers may be more willing than I to suspend disbelief. There’s much else to enjoy in the book. The prose was pleasant and the characters were vivid. Readers less obsessive about world-building than I am should consider this novel. Persona is available from SAGA. 1: I wonder: are you more likely to encounter incompetent assassins in a world with armies of assassins, or in a world where assassinations are few and assassins are rare? On the one hand, if you need armies of assassins you can’t be too picky. On the other hand, if assassinations are rare, assassins aren’t going to get much practice.